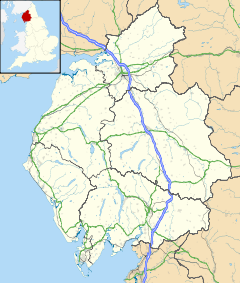 Crosby Ravensworth is a village, civil parish and fell in the Eden District of Cumbria, England. The village is about 4 miles (6.4 km) east of the M6 motorway, and Shap. Prehistoric remains include the White Hag stone circle (54°29′50″N 2°36′30″W﻿ / ﻿54.497294°N 2.608298°W﻿ / 54.497294; -2.608298). A pair of almost identical La Tène Celtic spoons dating from the Iron Age were found in Crosby Ravensworth in the nineteenth century and are now housed in the British Museum in London. A more recent monument at Black Dub commemorates the visit of Charles II of England in 1651. The fell also contains one of several sites in England called Robin Hood's Grave. Crosby Ravensworth Fell is the source of the River Lyvennet and is crossed by the Coast to Coast Walk. It features a considerable expanse of limestone pavement. An electoral ward in the same name exists. This ward stretches from Bolton south to Great Asby with a total population taken at the 2011 census of 1,396. ^ "Ward population 2011". Retrieved 20 June 2015. Wikimedia Commons has media related to Crosby Ravensworth. This page was last edited on 14 August 2017, at 20:14 (UTC).